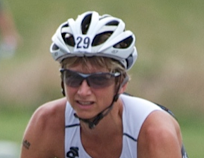 I have a good friend (and sponsor - Solar Connexion) who has become interested in the sport of triathlon as an outside observer of mine. He's been a valuable adviser because he questions convention, looks for evidence, and challenges assumptions that insiders tend to make. It helps that he's good with electrical/mechanical systems, physics, cars, bikes, that sort of thing, and he's tuned into the human element too. When I told him in April that I was thinking about going to an aero helmet (see The Aero Helmet Debate), he had some healthy skepticism and suggested not rushing into it. With primarily sprint races on the early race calendar, I agreed to hold off. I'm very glad I listened and waited because the season's bike improvements can now be attributed to the "motor" without confounds of the helmet. That translates to confidence in myself rather than in accessories. With Nationals up next, it seemed a good time to consider the helmet again. Over the last few months, I've borrowed and tried several brands of helmets. The Bell tipped back, the Rudy was too wide for my face, and the LG wasn't right either. I ended up getting Taylor Jennings' Giro Advantage 2 aero helmet after he switched to a Bell. 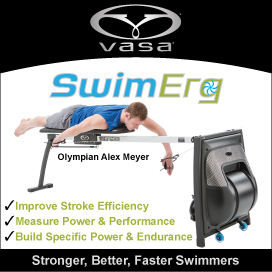 He won the men's side of my last race so I figured it comes with some built-in speed! 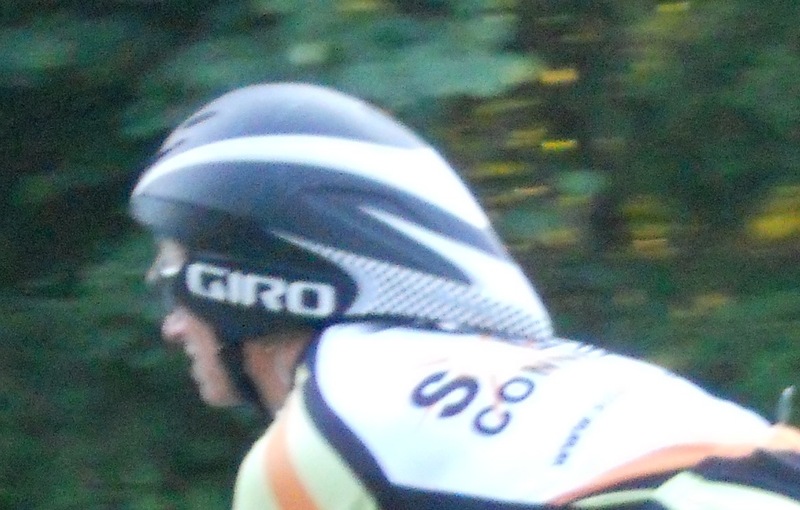 My conventional helmet is a Giro Ionis. I had the helmet, but in the meantime with such significant biking gains this season, I had become a little reluctant to change anything. If it "aint broke" did I want to "fix" it? Was I just "drinking the Kool-Aid"? Would it help, or might it even hinder? The only way to know for sure was to test it out and compare it to my conventional helmet. Ideally, I would want to compare helmets over an identical Olympic distance course but with fatigue factors they'd have to be on different days. The problem then becomes holding the human element - ME - constant. Try as I might, I am not the same from day to day in terms of energy, power, sleep, nutrition, and motivation. Nor are environmental conditions the same from day to day. Plus I was running out of time for a big experiment. The keys to any good scientific experiment are making it as close to the real world situation while controlling as many variables as possible. That is, keeping conditions constant, while manipulating only the variable of interest, i.e. the helmet. I would want the same weather conditions, course, and same me. This was our effort to conduct such a study. The aero helmet will result in greater speed/reduced time. I had a 4 x 3 mile threshold interval workout on the schedule so that seemed a good opportunity to test. Bryan agreed to help and we met up on a nearby bike-laned, long rolling road where I do a lot of my intervals work, and we marked out about three miles, delimited by road signs. I would time it on my Garmin but he would time it with a stopwatch (app) too. We debated the order of the helmets over the four "trials" as fatigue is a factor. The helmet that goes first has an advantage so it would be the conventional helmet. We considered two sequences for the four trials: (A) conventional - aero - aero - conventional [counterbalanced design] and (B) conventional - aero - conventional - aero. We went with the option B and in hindsight that was the right choice. It allowed for a comparison of degradation. The fatigue difference should be similar from trial 1 to 3 as compared to 2 and 4. I tried to keep things the same on each interval - getting up to speed in the same way, getting out of the saddle in the same places for the same number of pedal strokes, and same effort levels (basically all-out). After a 1-mile cool down, Bryan drove the bike and I back to the start to reduce inter-trial fatigue. While I didn't monitor it while I rode, my average heart rate was the same for Trials 1/2, and for 3/4 and average cadences were similar. 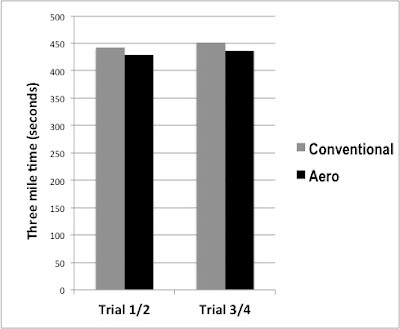 Data showed a 2.9% reduction in time from Trial 1 to 2 and a 3.5% reduction from Trial 3 to 4 for an average improvement of 3.2% offered by the aero helmet at these speeds and for this duration. There was a 2.3% increase in time comparing Trial 1 to 3 (both conventional) and 1.7% increase in time comparing Trial 2 to 4 (both aero). One would expect similar increases due to fatigue. The data suggest that the aero helmet offers a slight time savings. It's difficult to predict how the savings might extrapolate from a 3-mile max effort to a 24-mile sustained effort when my overall speed is lower. I was hitting 25-26 mph on these intervals but expect something closer to 22+ on an Olympic bike route. Air resistance is related to the square of speed. The number of trials was quite small, and the human element is an unknown. I can't rule out some psychological aspect of the helmet coming into play - feeling faster resulting in being faster. One might expect a more linear decrease in average heart rate across the four trials such as 167 - 166- 165 - 164. Rather, we saw a stair step 167-167 - 164-164. The differences are quite slight though. My takeaway is that the helmet will probably not make me slower and may make me a little faster, all things being equal. I'm glad to have my outside adviser (skeptic!) challenging ideas and making me work a little harder to make smart choices. Looks like this helmet is going to Burlington for the real test.